Who can resist the charm of a century-old Sydney terrace house? What lies beneath, however, are grey areas of discovery and renovation challenges. Today, we are giving this old terrace a second chance at living life to the fullest, including a solid foundation for what will soon become a beautiful family home. We have made a promise to deliver a fully renovated home in time for Christmas, so here we go! Come inside and find out what’s going on behind the blue front door . . .
We decided to replace the original timber floor to see the home through another 100 years! So we started again, making sure the house begins its new life on solid ground. A big part of our renovation brief was to double the kitchen floor area and extend the house. Meanwhile, a new oversized skylight will bring in an abundance of natural light, brightening up the front of the house. Today, part of the house is temporarily suspended above the ground by a forest of steel pillars. Upstairs we discovered with surprise that the original insulation in the ceiling was never used as intended but was still rolled up, waiting to be installed! To optimise and increase the scale of this bedroom we have revealed the original ceiling line to create a vaulted ceiling. 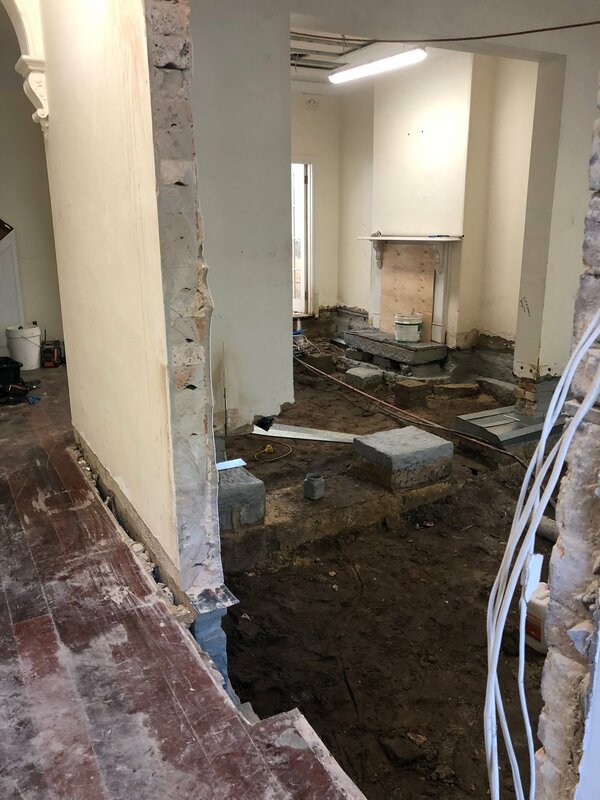 We love to mix it up and play with the original features of an old home, such as this fireplace, which will become a luxurious and unexpected detail in our client's master ensuite. Follow our #MoncurStreet project on Instagram to see what other discoveries we find behind the blue door . . .